People often ask me for the essential Nigerian food ingredients that Nigerian food lovers should always have in their kitchen. 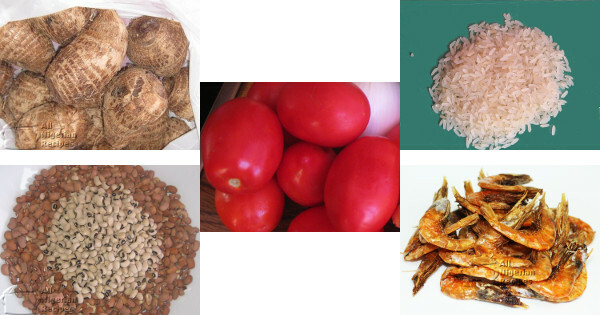 So here is a list of the essential ingredients for Nigerian food recipes. You can buy all these ingredients in Nigerian food markets and African food shops in all major cities of the world. Watch this video, this video and this video to see some of these ingredients in living colour. In Nigeria, we use stock cubes to cook virtually every recipe: Soups recipes, Rice recipes, Beans recipes or Plantain. Once you will add ingredients to the Nigerian meal you are cooking, then you should add stock cubes to it unless you do not eat them at all. The most popular stock cubes used in Nigerian food recipes are Knorr, Maggi and Royco. If you are allergic to MSG or you do not want to eat it, read the labels of these seasoning cubes to make sure the one you are using does not contain MSG. You can also make yours. Click here. Salt is added to almost every Nigerian food recipe. The exception to this being Custard/Akamu/Ogi and the fufu meals. For the fufu meals, they get their taste from the soup that goes with the meal. If you are advised by a doctor to stay off salt, then by all means leave it out when preparing your Nigerian meals. Thyme is an important seasoning when cooking beef or chicken for Stew and Rice recipes. Please do not add thyme when cooking meat that you will use to prepare Nigerian Soup recipes. That's a big no-no. Onions should be used when cooking beef or chicken that you will use to prepare the Nigerian Stew Recipes and the Nigerian Rice Recipes. It can also be used for some Nigerian Soup Recipes examples: Okra Soup, Pepper Soup, Banga Soup and Edikang Ikong Soup. It is not advisable to use onions for Egusi Soup but it's not too bad if you use it. But NEVER add onions to Bitterleaf Soup and Ora (Oha) Soup. It will take away the traditional/classic taste of these soups. Palm oil is the preferred cooking oil when you want to prepare Nigerian Soup recipes. The best palm oils are the ones that are pure red and free flowing. If the palm oil is orange or even yellow in colour, it means it was not well processed and contains a lot of water. This may cause it to be smelly and this will adversely affect the taste of your Nigerian soup dishes. Congealed palm oil is not necessarily bad. Most palm oil sold in western countries may be congealed due to the cold weather. Pure vegetable oil is used to cook all Nigerian Rice Recipes and Nigerian tomato stew. It is also used for any recipe that requires frying, examples: Fried Plantain, Fried Yam and all the fried Snacks recipes. Groundnut Oil is used as an alternative to pure vegetable oil but due to its strong taste, it is not so popular. If you are outside Nigeria, Sunflower Oil is a very good alternative to pure vegetable oil. Whatever you do, NEVER use Olive Oil to cook Nigerian recipes. The taste is so strong that the food will not taste Nigerian. These include all hot peppers: fresh, dry, chilli, habanero or scotch bonnet peppers.With the exception of Nigerian Snacks and Nigerian Fried Rice, hot chilli pepper is present in all Nigerian foods. Even if you don't like pepper, it is always good to add a tiny quantity because this will bring out the taste of your Nigerian meals. If pepper is absent, the food will taste bland to any Nigerian person. Curry powder is mainly used when cooking Nigerian Fried Rice. This curry powder is what gives the meal the yellow color so endeavour to add curry powder else your Nigerian Fried Rice will not look appetizing. Please note that this curry powder is not the hot Indian curry. It only serves as a colourant. Ask your African food grocer for Nigerian or African curry powder that does not contain chilli. You can also add this curry powder to Nigerian Beef and Chicken Stew to help remove traces of sour tomato taste. It also gives the stew a nice flavour. Plain flour is the basis of a majority of Nigerian snacks. Flour is often used as a thickener for the Nigerian Vegetable Sauce. Plain flour is used to prepare some quick and easy recipes so you should always have it in your kitchen. In Nigeria, we use only one type of fresh tomatoes; plum tomatoes to cook Nigerian dishes. This is known as tomate pera in Spanish and pomodoro pera in Italian. Most other types of tomatoes have strong smell and taste so they are not good for preparing the Nigerian Tomato Stew or Nigerian rice recipes. Crayfish is essential when preparing Nigerian soup recipes. If you don't have it where you live, you can make some. Use it especially in Nigerian soups because it makes them taste good. Nutmeg is not used in a lot of Nigerian recipes but when it is used, it plays a very important role. Nutmeg is the ingredient that gives Nigerian Moi Moi, Nigerian Puff Puff and Nigerian Chin Chin their unique taste so do not miss adding nutmeg to these Nigerian recipes.